I recently met resident Afsaneh Metaluna, a story-teller and award-winning filmmaker in both SL and RL. Freed from real world limitations, Afsaneh is able to create and perform her art in SL in ways that would never have been possible otherwise. She currently resides and performs in Falathrim in Elf Circle. 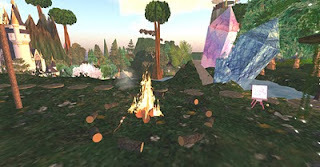 http://slurl.com/secondlife/Falathrim/66/222/46. On September 18 at 11 AM SL, she will present a workshop there on storytelling techniques. Falathrim is owned by Fleure Homewood, her friend and a patron of the arts who hosts many music performances and also has an art gallery there. As you can see in the photo, it is a colorful and imaginative site. Afsaneh is also a member of Myth Systerhood & Company, a group dedicated to providing opportunities for storytelling to flourish in SL. When a disability that limits her mobility caused her to limit her RL performances, Afsaneh came to SL. Now, without those constraints, she is free to concentrate on her art. She estimates that she has given over 150 storytelling performances in SL since 2009. Her real-life husband initially suggested that she come into SL, and together they created their own “Ildathach”, a sim and group dedicated to storytelling. After about a year, however, she decided to close it because it required so much time and resources that her ability to be creative in other ways was hampered. She has since transitioned to the storytelling group, “Myth Systerhood & Co.” This is her main performance group, and it also provides opportunities for residents to participate in the stories she tells. When I asked Afsaneh about the origin of her name, her sense of humor sparked. “It may be derived from a Persian word for ‘fairy tale’,” she said, but then she explained that since she doesn’t speak Farsi it could mean ‘lamb kebab.' But it had a fairy-tale sound to it, and she liked the way it went with the Linden last name she chose. “The surname is cool,” she said, “because I can offer group members the alternative tag of "Metalunatic." In addition to her stories, the RL Afsaneh (Dr. Seana Kozar) has been a full-time filmmaker since 2002. Her transition to filmmaking came about when her storytelling was limited by RL issues of bad weather, budget cuts, and mobility. Her first work, “Almost Normal: Stories From the Well Within”, is about women with invisible disabilities. Produced in 2003, it combined video, experimental animation and oral storytelling and was broadcast in Canada in 2004. Her latest film, “Nothing Like Her” was produced in 2009 and has screened in 23 festivals worldwide and has received two awards to date. However, she missed being able to interact with a live audience. Now, through SL, she is able to do both. She has screened some of her films in Second Life and says she will do so again when she completes her latest work. In addition, she will be returning to storytelling on a regular basis this fall with “1001 Storied Sunday Nights", beginning on September 12 at 6 PM SLT. Each story will be between 30 and 45 minutes long, and after that she will play music that ranges from Eastern and World techno to medieval. But she promised that it will all be suitable for dancing. Additionally, on alternate Saturdays starting Oct. 2, she plans to host "Elevensies with Afs", which will be broadcasts of her previously recorded live performances with chat transcriptions for those residents who like or need text support.